Hi, the flexible tails provided with this tap are 42cm (420mm) in length. Thank you for your question, I hope this helps. hi Rod, the base of this tap is 55mm so yes it would fit over a 35mm hole. Thanks! 1 out of 3 found this question helpful. 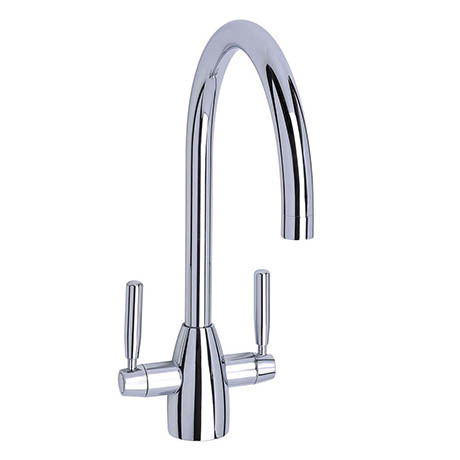 Q. doea this tap have an aerator? I have checked with Mayfair and they have confirmed that the Rumba Mono Kitchen Tap - KIT147 does have a white plastic 'water softener' in the spout. I queried whether this was an actual aerator and they have confirmed it is more of a 'diffuser' but does the same job. I hope this has helped, thank you for your question. The problem is the tap has what I call "after run" ie when the tap is turned off, within a couple of seconds the water in the pipe will flow out for a few seconds. Have had two other mono mixers before and had no problem with them.